Research within the Institute for the Study of Peak States (ISPS) is a driving force behind the Peak States clinics and therapies. Our ground-breaking work in the field of subcelluar psychobiology and prenatal trauma healing is leading to treatments for addiction, autism and other diseases. Early indications are that a a very large range of other disorders may eventually be treated through these techniques, such as multiple sclerosis, dyslexia, fibromyalgia, and diabetes. In addition to neurological developmental disorders, we are also engaged in fascinating work in the field of consciousness studies. Our research has shown that positive states of mental health - "peak states of consciousness" - enjoyed by a lucky few, are actually everyone's birthright. Healing certain prenatal trauma can lead to what we term "peak states". For example, one such process gives a state we call Inner Peace. If you know anyone who rarely becomes agitated or anxious, whatever the circumstances, then it's likely that this person has a degree of Inner Peace. This means that they experienced a particular event in their physical development in the womb without trauma. We have found ways to access and heal the trauma that inhibits this state, leading people to feel much more peaceful regardless of external circumstances. As you can imagine, this work is at the forefront of consciousness research and it will be years before the full implications of our findings are realised. It doesn't help that some of our discoveries contradict current mainstream scientific opinion. However, the techniques developed from our model are easily demonstrable and reproducible, such as with The Silent Mind Technique™. Consequently, we believe that it won't be long before scientific opinion fully accepts the importance of pre-natal trauma in the field of well-being and disease. 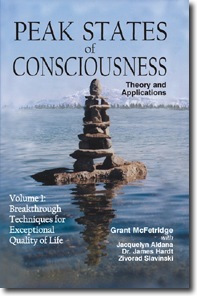 For more information on ISPS, please see the main Institute website at www.peakstates.com and the textbooks Peak States of Consciousness Volume I and Volume II. The Institute for the Study of Peak States dedicates itself to the study of the human psyche, focusing on the psychology and biology of consciousness. The institute researches and formulates techniques to heal traumas and specific conditions to improve lives and enhance consciousness. Its groundbreaking discoveries in prenatal development have led to the creation of techniques for acquiring exceptional states of consciousness and treating serious diseases. ISPS is establishing a world-wide network of healers, clinics and training programs to make its research and development and its unique techniques available to therapists and clients. This tremendously exciting and new field has stunning practical applications in the areas of psychology and medicine. 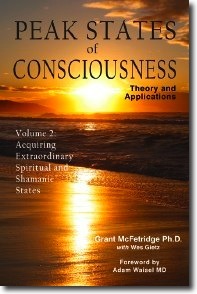 For more information, please go to the Institute website at www.peakstates.com. 1.0 Jan 6, 2010: First draft of this webpage.